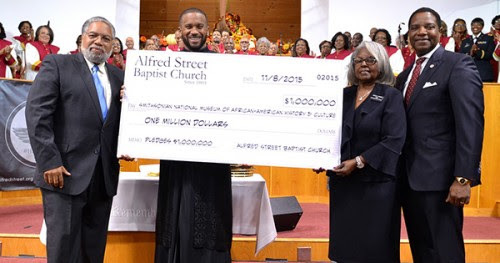 Alexandria, VA — In the final days of 2015, Alfred Street Baptist Church (ASBC), one of the nation’s oldest historically African American churches located in Alexandria, Virginia, announced that it is pledging to donate $1 million to the Smithsonian’s new National Museum of African American History and Culture (NMAAHC). As such, the $1 million donation to the museum is the largest from a faith-based organization to date, thus allowing the church to be designated as a founding donor of the museum. Scheduled to open in the fall of 2016 on the National Mall in Washington, DC adjacent to the Washington Monument, the museum will be a place where visitors can learn about the richness and diversity of the African American experience, what it means to the lives of the American people, and how it helped shape this nation. “We are very proud and honored to make this contribution to a museum that promises to contribute immensely to the knowledge base of African American history and culture.